Call it the year Santa Rosa embraced Santa Claus – or rather, the year downtown retailers discovered the jolly ol’ elf was a great salesman. 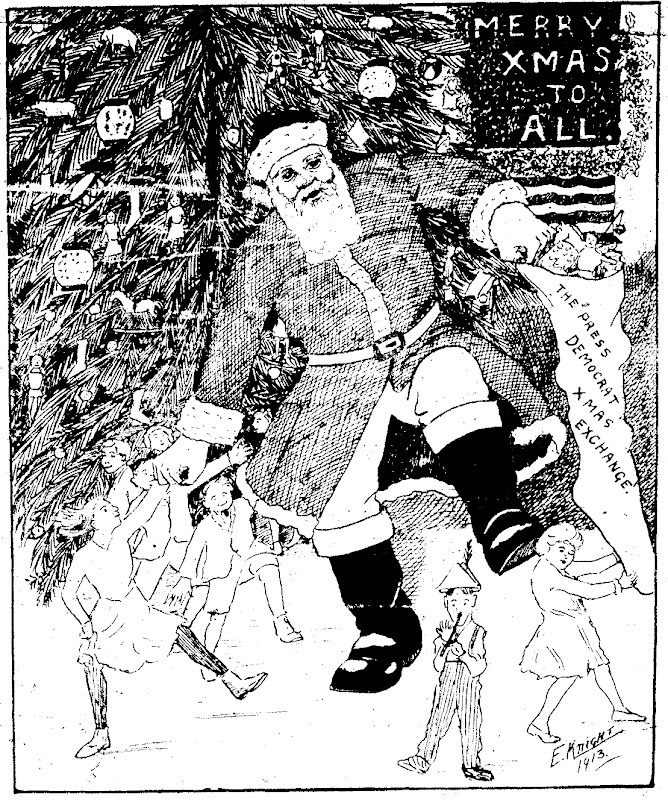 In the days before Christmas 1913, Santa invaded the advertising in the Press Democrat. The full page ad for the White House department store (shown below) had no less than four Santas, which was about the headcount seen in all ads in any year prior. Why the population explosion in 1913? It wasn’t as if Santa was suddenly linked to the concept of Christmas presents. 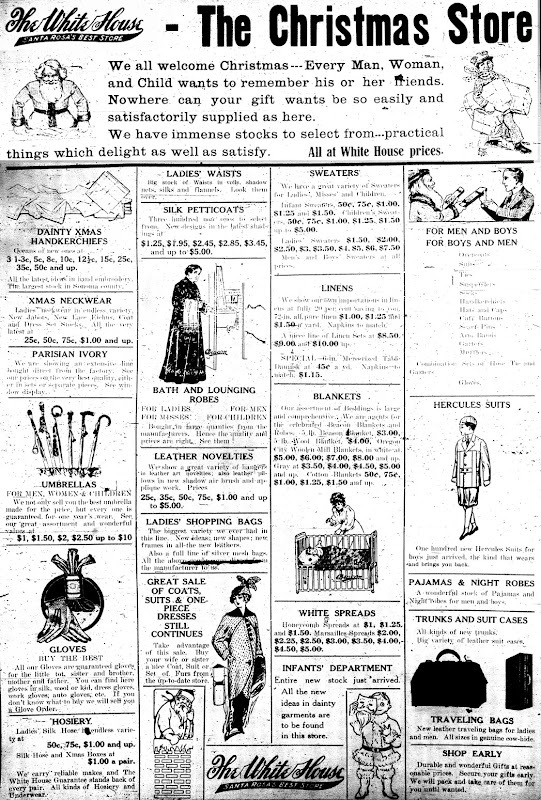 During the Christmas of 1910 advertisements urged shoppers to come downtown and have fun buying gifts. The part of the White House ad below with Santa leaning on his knuckles first appeared that year, and another 1910 store proclaimed it was “The Real Home of Santa Claus.” Kids back then were also clued in to making want lists; in 1908 tykes picked up the telephone and asked the operator to connect “Santy Claus.” The PD reported the telephone office didn’t know what to do at first but soon decided the “Hello Girls” should become Santa’s little helpers, with the chief operator taking down names and list details (and no, their parents were not required to first sign two-year service agreements). Those pre-1913 Santas are also sometimes hard to recognize. He was less roly-poly than we expect today (the guy in the White House ad was pretty buff) and was more like Father Christmas of 19th century England. 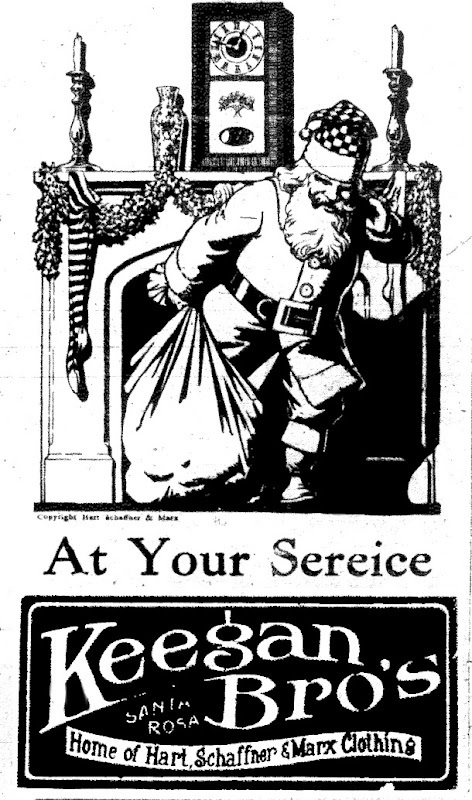 He rarely smiled in the earlier ads and even appeared a little grumpy; in this Keegan Brothers ad he looks stooped and damn tired of hauling that bag down chimneys, as if he were just an oddly-dressed workingman in the delivery business. (The caption should have read “At Your Service” and was corrected in later versions.) So another change in 1913 was that Santa was happier as well. 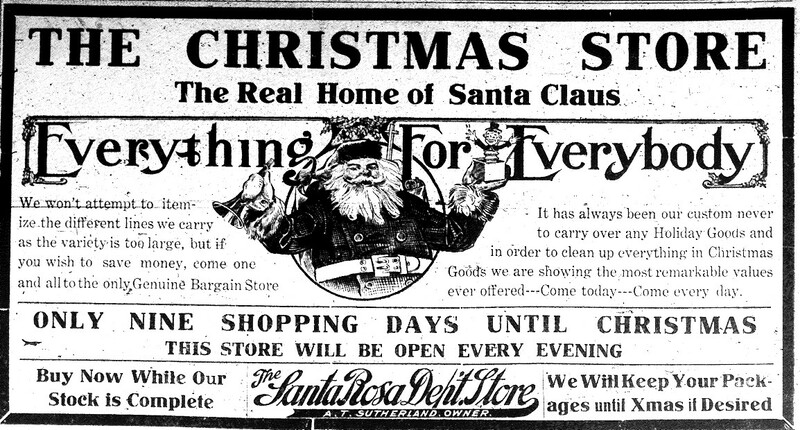 It would be easy to presume Santa received a 1913 makeover by a Madison Avenue advertising agency and everyone followed suit, but that’s not the case. It would be many years later, in 1931, before Coca-Cola would forever transform Santa into the iconic image we all know today. Instead, he evolved in the 1910s and 1920s into a ruddy obese fellow without any firm ownership. A personal favorite is the 1923 ad for White Rock soda water showing Santa apparently reading letters from children with his nose as red as his cheeks, having polished off half a bottle of bourbon. Note that his trash basket is overflowing with tossed-out Christmas lists and also note the year 1923 was during Prohibition. Are YOU gonna confront Mr. Claus when he’s being naughty? I think not. The mystery of Santa Rosa’s Santa ads only deepens when compared to the big Bay Area newspapers where Santa was almost a no-show. In San Francisco and Oakland the holiday shopping ads usually just showed the merchandise if there was any illustration at all. Never did any of the Santas found in the PD appear there. Among the California newspapers with online archives (a pretty small number, admittedly) the only papers which were similarly Santa-clogged came from Modesto and Santa Ana – towns which were very much like Santa Rosa: Mid-sized rural county seats with a few department stores. Their department stores ads even used most of the exact same Santa illustrations as our department stores, demonstrating it was stock art provided by the manufacturers (free, undoubtedly) to dress up ads in these smaller markets. Instead of pushing specific stuff or a sale, the mission of these 1913 Santas was simply to get your warm body into those local department stores. It was by no means assured customers would be going to those merchants anyway; as shown in the article about Christmas 1910, they were competing with hardware stores which advertised “practical” gifts. Hopefully if the holiday shopper could be lured through the door of Rosenberg’s, Dibble’s or one of the other places, a new galvanized wash tub would no longer seem to be an appealing present. No discussion of Christmas in 1913 Santa Rosa would be complete without mentioning the 800 lb. gorilla in the room – or rather, the Godzilla-like Santa that appeared on the front page of the Press Democrat on Dec. 25. Taking up half of the front page, the cartoon illustrated a story about the PD’s Christmas Exchange, which was the annual holiday gift drive for needy kids. Here Santa teeters unsteadily as little two-dimensional creatures tug at his hand and gift sack. His blank expression makes you wonder if he had way too many of those bourbon and White Rock sodas before coming to the party.